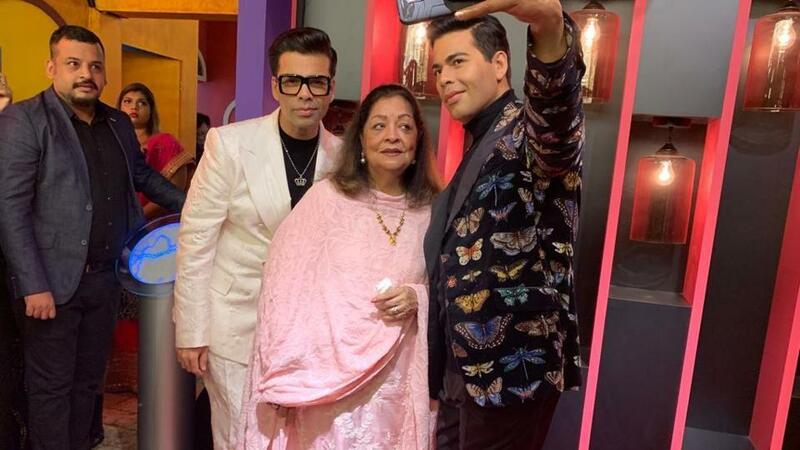 The Bollywood Filmmaker Karan Johar Wax Statue Unveiled at Madame Tussauds Singapore on Thursday and Karan Johar was accompanied by mom Hiroo Johar. In the pictures shared online, Karan Johar and Hiroo stand beside the statue that strikes the pose of taking a selfie. The Karan Johar Wax Statue shows KJo donning a black ensemble paired up with a printed jacket. Karan Johar had earlier informed that the unveiling would be live streamed from Sentosa. “Join me for the unveiling of my Wax Figure! It’s the Ultimate Film Star Experience. Only two more days to go, unveiling on April 4. Follow @mtssingapore for the live streaming, starts 10 am SGT,” he tweeted alongside a picture showcasing him holding hand imprints and a copy of his book, An Unsuitable Boy, lying on the table.